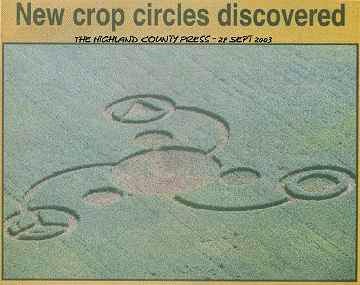 September 28, 2003, newspaper article in The Highland County Press, with aerial photograph of another crop formation in a soybean field not far from the Seip Mound in Bainbridge, Ohio. Aerial photograph © 2003 by Dan Music and Ron Tillis. October 2, 2003 Bainbridge, Ohio – On September 28, 2003, The Highland County Press newspaper in Ohio, published an aerial photograph by Dan Music and Ron Tillis that showed the second Bainbridge crop formation in soybeans this year. 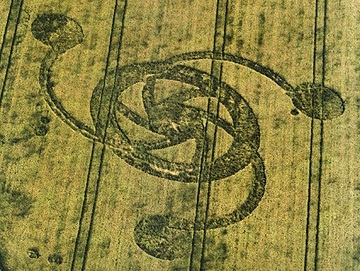 The newspaper reported that the two men “were flying over the area recently in their private plane and were surprised to see the designs cut into this bean field. Local residents said they suspected young people on four-wheelers had made the design. 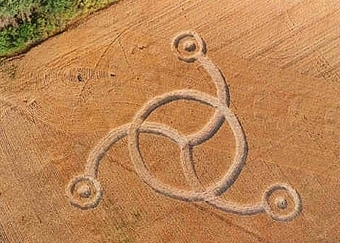 Several other crop circles have been found in the area, including one discovered August 23 (correct date is August 24) near Serpent Mound in Adams County. 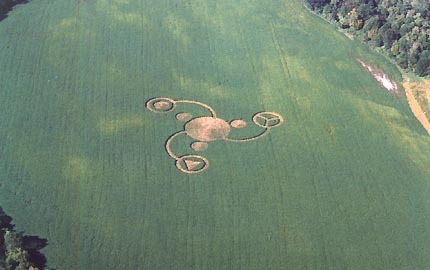 A third crop circle was recently found and photographed near Seip Mound in Ross County.” See 09/12/03 Earthfiles. The pattern in the aerial photograph is crisply laid out in 40-acres of soybeans surrounded by Paint Creek, said to be the largest creek in the United States. The creek flows in a large heel-shaped loop around the soybean field and its water is lined by tall trees. There are only two access points to the field and they are at least a half mile from the nearest road that passes one of the landowner’s homes. Then you still have to cross Paint Creek to get into the field. The circle of dense trees grow along the water of Paint Creek, Ross County near Bainbridge, Ohio, as it flows around the soybean field in which the three-armed pattern was created by downed, woven and standing crops. Aerial photograph © 2003 by Jeffrey Wilson. Delsey Knoechelman who discovered and first reported the August 24, 2003, Serpent Mound pattern that was also in soybeans, saw the newspaper article and contacted field investigator, Jeffrey Wilson. On Saturday to Sunday, September 27-28, Jeff, his team of investigators and several local volunteers set out to obtain permission from the soybean farm owners and to get out on the island to make measurements, sample soil and plants and take a variety of instrument readings. Jeffrey Wilson, Independent Crop Formation Investigator, Master’s Degree in General Science, Dexter, Michigan: “We managed to contact one of the land owners and had to do some convincing to get him to allow us into the field. (Even with the newspaper’s aerial photograph), he didn’t believe at first that there was any formation in the field. He finally took us out to the site and we couldn’t see the formation even from the edge of the field once you got onto the island. We had to climb a tree to locate where it was in the field. There were no tracks whatsoever going into the formation itself. There were no tramlines, no sprayer lines in the field, nothing like that whatsoever. We were the first ones to make our way, rip our way, through that dense foliage of soybeans to get to where the formation was. We went around the entire field to look for tracks. We did find one deer track that went into the field and found several deer beds, but found nothing else going into the formation. The aerial photos that we managed to obtain that people had taken before we got out there, they don’t show any tracks. Other ones taken that show tracks are tracks that we made and others made after we started investigating (on Saturday, September 27). 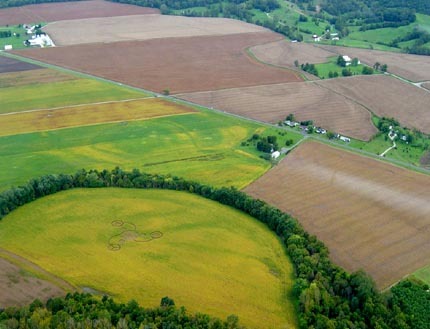 Paint Creek Island, near Bainbridge in Ross County, Ohio, formation in soybeans about 30 miles from the Serpent Mound pattern – both probably occurred around same date of August 24, 2003. Aerial photograph © 2003 by Dan Music and Jeffrey Wilson. WHY DO YOU THINK THIS PAINT CREEK FORMATION IS A MONTH OLD? There are multiple landowners that own this field at this point. I guess it’s going through a legal division. The first landowner took us out there the first day. The second landowner we talked to on the second day of our investigation. He is a pilot who owns a plane that he lands at a grass strip about a quarter-mile to half a mile to the west of the island and flies over it quite regularly. He remembers one day back in late August where it had rained heavily early in the day until about noon. It cleared up and he flew over the field to land his airplane. There were no markings in the field. SO YOU’VE GOT A PILOT WHO CAN TESTIFY THAT HE HAD FLOWN OVER THE FIELD ON A SPECIFIC HOUR AND DAY AND THERE WAS NO PATTERN? Right. And the next morning, he flew back over the field and the formation was there. AND THAT WAS AUGUST 24? At this point, we’re saying it’s late August. He’s trying to track down exactly the date and get back to us. We think it is roughly the same time as the Serpent Mound formation. See 09/05/03 Earthfiles. Pattern in soybeans was 280 feet in diameter. Middle circle measured 90 feet across. Aerial photograph © 2003 by Dan Music and Jeffrey Wilson. WHAT WAS THE MEASURED DIAMETER FROM THE FURTHEST SIDE OF THIS PAINT CREEK PATTERN TO THE OTHER? It’s roughly 280 feet by 280 feet by 280 feet if you consider it a triangular feature, which is very comparable to the Serpent Mound formation that we went to which was roughly the same size in its longest length, roughly 280 feet. The size being about the size of a football field ­ that’s a big formation to go down. 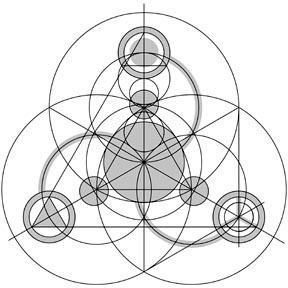 Maybe they (formation-makers) need that much space to make the geometry that is there. I don’t know. To give you an example, the central circle in this new Paint Creek Island formation ­ the center circle was about 90 feet in diameter. When I got my start back in 1996, the very first crop formation I went to in Paulding, Ohio, which is in northwest Ohio ­ that single circle was 90 feet in diameter. So, we’ve really expanded the size of what we’re looking at over the years. BEING A MONTH OLD, WHAT IS IT ABOUT THIS PATTERN THAT IMPRESSED YOU AS BEING IN THE CATEGORY OF THE MYSTERIOUS? We got to the formation and there weren’t any tracks going in, no human footprints, no markings that made there way through the field. As inaccessible as it is, you can’t see it from any road way. You have to walk at least half a mile to get to the field and then you’ve got to walk into the field and somehow manage to not make any markings. When we walked through the field as careful as we were, we left tracks behind us. Second, we looked at the way the plants were laid down in the field. They were all swirled clockwise and we found in the formation that there were several areas that had multiple layers to them, up to four layers woven together. We think that would be extraordinarily difficult to weave together soybeans in the first place. You might be able to make a simple 2-layer pattern, but we don’t think anybody could make a 4-layer pattern. We found, for instance, in the triangle of one of the arms ­ to make the triangle itself, the plants were actually curved and bent at the proper angle to make the points of the triangle. It wasn’t as if the plants were laid down flat and then another set of plants were laid down flat to make that angle of the triangle. The plants were bent in that angle. You can’t really bend soybean plants without snapping the stalks. So we found that to be quite convincing. We also discovered the same kinds of leaf base damage that we discovered in the Serpent Mound formation. Again, we don’t believe that is a hoaxable effect, although we’re still studying the effects on soybeans from certain things and we couldn’t say for 100% sure, but we’re pretty certain that’s not a hoaxable effect. THAT IS WHAT APPEARS TO BE HEAT OR SCORCH OR DARKENING AT THE BRANCHING OF THE SOYBEAN STEMS? Yes, that darkened, shriveled up affect. IN COMPARISON TO THE SERPENT MOUND FORMATION IN WHICH YOU FOUND ALL THE ANOMALIES THAT YOU WERE MEASURING FROM THE MAGNETOMETER AND ELECTRIC FIELDS TO SOIL AND PLANT ANOMALIES, WHERE DOES THIS NEW ONE FALL IN THE CATEGORIES OF ANOMALIES THAT YOU HAVE BEEN ABLE TO RECORD? It’s been our experience over the last six or eight years doing the kinds of metered studies that we have done in terms of measuring for electric fields or magnetic fields or measuring for radioactivity and things like that ­ that we don’t find any sort of anomalies after about ten days after the formation occurs for whatever reasons. The measurable effects are very short-lived. So, for this formation to be four weeks old, we didn’t expect to find any of those anomalies, even though we did the tests. Even though I haven’t done the statistical analysis, just eyeballing the numbers, it doesn’t look like there are going to be any changes there and we didn’t expect to find them either (after so long). YOU HAVE STRESSED HOW DIFFICULT IT IS TO MOVE THROUGH A SOYBEAN FIELD WITHOUT THE STEMS CRACKING AND BREAKING OFF AND HERE IS A FORMATION THAT IS A MONTH OLD. AND YET, IN THE AERIALS, IT LOOKS EXTREMELY WELL-DEFINED AND CRISP, VERY SIMILAR TO THE SERPENT MOUND FORMATION, A MONTH LATER. Yes, it’s quite interesting how formations can escape intact without any damage for that length of time. ON THE GROUND, WAS THE CRISPNESS OF THE PATTERN THERE? OR IS IT ONLY A FUNCTION OF LIGHT ON THE PLANTS FROM THE AIR? No, it’s pretty well defined, even on the ground. If you make the comparison to wheat fields which show really well-defined patterns from one stalk down in the same bundle of stalks that are standing up ­ we found that to be the case even in the soybeans. Even within the same grouping of plants along the planter line, half of them could be down and half of them could be standing. It was pretty well defined. Some people talk about like sort of a ‘veil’ pattern where there will be single standing stalks of wheat that are separating two circles. That also happened with this Paint Creek one. The triangular circles away from the central circle were down almost to a single line of soybean plants that were still standing, kind of a ‘veil’ effect there. ONE OF THE THINGS THAT FIRST HIT ME IN LOOKING AT ONE OF THE AERIALS THAT WAS A LITTLE FURTHER AWAY, I THOUGHT THERE IS THAT MERCEDES HOOD ORNAMENT AGAIN. WHEN I SAY THAT, I’M REFERRING TO THE HOAX AT THE SEIP MOUND. Earthfiles 09/12/03. The circle feature that you’re talking about is at the end of one of the arms. The feature there is standing crop and pressed down into the standing crop, there are three arms that kind of come together in a ‘Y.’ That’s what you are referring to a Mercedes Benz type symbol. A lot of people are calling it a ‘Peace’ symbol, but it’s not. If it were, it would have an additional arm going up between the Y. But in this case, there are those three arms that make the Y, and then there is sort of a half arc down below one of the arms of the Y. Diagrams based on aerial photographs © 2003 by Bert Janssen, The Netherlands. That feature is there and is part of the formation. The arc was about three or four feet wide and it started on the western most side and swirled in the direction clockwise to the eastern most side before it just ended. The plants are curved in on themselves to define the end of that little arc. The arms themselves are laid down directed toward the edge from the center, and where all three of those arms meet – that is one of the places where they are woven together, one in about four different layers. THE PATTERN REMINDS ME OF FRACTAL ARMS EVEN IF THIS IS NOT TECHNICALLY A FRACTAL. It does have that curvature of the triple Julia Set or the formation that showed up at Knobel, Arkansas this year. See: 06/13/03 Earthfiles. The arms are curved in the same direction. But I want to say this formation looks a little more similar to one that showed up in Kalispell, Montana a few years ago on August 14, 2000. See 08/27/00 Earthfiles. That one had a central circle with three arms curved in the same direction with a circle at the end of each arm. That formation seemed a little more basic than this one (at Paint Creek, Ohio), but essentially a similar geometry. It’s a little more complex and defined than the Kalispell, Montana one, but I would compare it more to that than a fractal design. August 15, 2000, first aerial photograph of Kalispell/Whitefish, Montana wheat formation by pilot Gilbert Johnson near intersection of Highway 93 and Church Avenue. Photograph © 2000 by Gilbert Johnson. Berwick Bassett, Wiltshire, England north of Avebury, discovered in wheat on May 28, 1994. Photograph © 1994 by Andrew King. COULD YOU TALK A LITTLE BIT ABOUT THE LAND ALIGNMENT AND THE FEATURES BETWEEN THE PAINT CREEK PATTERN AND THE SEIP MOUND? As best that we can tell from the aerial photos, we’ve been able to reconstruct the formation on an aerial satellite photo map and we believe at this point that the triangle in one of the outer arms, the easternmost arm, the point of that triangle points in almost the perfect alignment with the central major mound in the Seip Mound earthworks which is less than two miles away. The Seip Mound earthworks was a large area of earthworks in which only the major central mound, which is about 35 feet high and about 60 feet high, is one of the few remaining mounds that still exist at that earthworks site. Paint Creek island formation on left. Yellow line extends to Seip Mound about two miles away. Satellite image and diagram produced by Delsey Knoechelman. THIS ALIGNMENT, OR PROXIMITY OF THIS NEW FORMATION, TO THE SEIP MOUND IS SOMEWHAT ANALOGOUS TO THE SERPENT MOUND FORMATION OF AUGUST 24 BEING ABOUT A HALF MILE OR SO FROM THE SERPENT MOUND. The Paint Creek island itself upon which the formation sits has been known in historic times to have been the site of at least three different American Indian villages over time. One of the landowner’s homes sits on the site of a 2-tiered Indian platform mound that was destroyed within the last one hundred years. His grandfather destroyed half the mound constructing his house. Then the railroad built through the area and destroyed the other half of the mound, but his grandfather put his house and basement right into where the mound was. That mound is about a quarter-mile away and Seip Mound is two miles away. Satellite image © 2003 GlobeXplorer, United States Geological Survey, and titling produced by Jeffrey Wilson. HOW MANY MOUNDS IN TOTAL ARE THERE BETWEEN THE SERPENT MOUND AND THE SEIP MOUND IN BAINBRIDGE? That’s a really difficult question because most of the mounds in Ohio have been obliterated by agriculture. In the valley where Paint Creek is all the way to Chilicothe, there are more than 50 mound sites and several are large geometric mound sites that exist in about a 10 to 12 mile line down this valley. 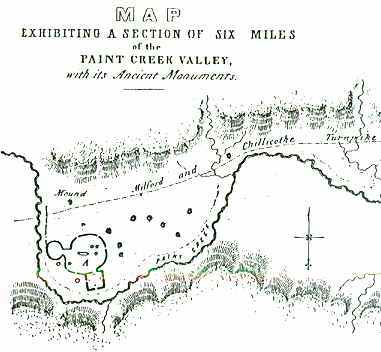 One of the maps I sent you is from 1847 by Squire and Davis that shows a six mile section of the Cave Creek Valley. Squire & Davis map dated 1847 of the Paint Creek Valley in Ohio that contains at least fifty ancient mounds between the Seip Mound labeled “A” and Chilicothe about ten miles east. On the farthest west or left side of the map, is the Seip Mound earthworks. And right where the ‘A’ is, that long oval feature inside the geometric part, is the mound that is left that we think is in alignment with this Paint Creek formation. The mounds, the little black dots just to the east of that Seip Mound earthworks enclosure, are known as the Dill Mounds. All of these are Hopewell Indian mounds. The road that is on the map ­ the Milford and Chilicothe Turnpike just to the north of the Seip Mound ­ is now what is known as U. S. Route 50. Eastern half of the Squire & Davis map dated 1847 of the Paint Creek Valley in Ohio. 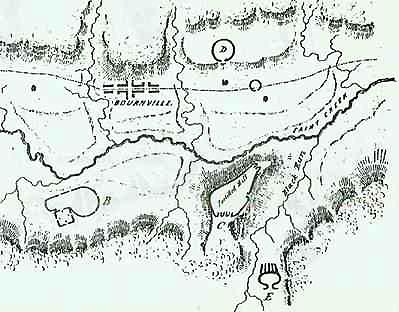 As we continue towards the east, toward Bourneville (on old map, Bournville) on U. S. Route 50, the old Milford and Chilicothe Turnpike, just before you get to Bourneville – just southwest of Bournville – is the next major mound enclosure there. That is the Baum earthworks. That is also another Hopewell feature that has been completely obliterated by agriculture. Just across the Paint Creek from whee the Baum earthworks are located is the hoaxed Mercedes-Benz symbol that showed up just between U.S. Route 50, or the Chilicothe Turnpike, and where the Baum earthworks is. Then as we continue from where the Baum earthworks are and we keep going east, the next feature below Paint Creek on the map is “Fortified Hill.” That is also known as Spruce Hill, which is one of the hilltop enclosures that in this case is unusual in the fact that it is a stone enclosure, rather than an earthworks enclosure, which is very rare to find in Native American sites. The feature just below Spruce Hill ­ that kind of oval with the lines radiating upward from it ­ has also been obliterated and I don’t think that feature has ever been named. So, that six miles there has several major earthworks that were very important to the Native American culture. 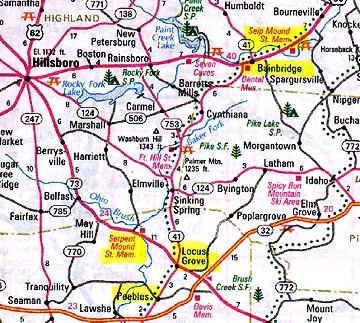 If we continued west off the map, less than a mile or two, we would get to where the new Paint Creek formation is. 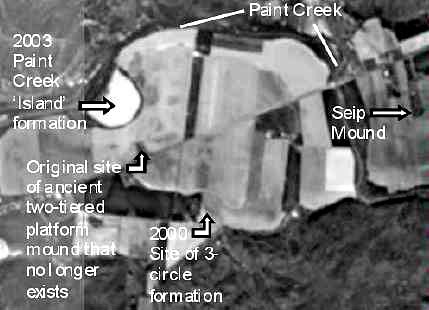 THE QUESTION IN 2003 IS WHY IS SOMETHING TRYING TO FOCUS OUR ATTENTION ON THE SERPENT MOUND AND THE SEIP MOUND AREA? Yeah, that’s a good question. Although we might not have been paying attention in previous years. Less than a mile from where this Paint Creek formation came down across Route 50 to the south is the site of a crop formation that came down in the year 2000. There were three circles in that formation ­ two of them had rings around them. Really, it was in close proximity to the Seip Mound and where the Paint Creek formation came down. The landowner who is the pilot who spotted the formation back in late August, also told us this island itself has been the site of crop circles just about every year since he was a kid. He’s in his 50s now. He said he has been seeing two or three single circles not more than 18 or 20 feet in diameter show up just about every year. He said he has never reported them because he thought they were natural affects due to whirlwinds. He never took a picture of them and he never really reported anything like that. So, maybe this has been going on for awhile, but we just haven’t been paying attention. WOULD THOSE HAVE BEEN IN SOYBEANS OR A DIFFERENT KIND OF CROP? He said that he has seen them in both soybeans and wheat. Although, the formation that came down in 2000 across Route 50 was in wheat. WHAT ABOUT THE INTEREST IN GETTING IN TOUCH WITH YOU BY THE MAYOR OF BAINBRIDGE? On my way home from the formation on Monday of this week, I got a call from the Mayor of Bainbridge, Ms. Rocky Countryman, who had read about our work at the Serpent Mound formation and wanted to notify us of this new formation that had been reported and wondered if we could come down and take a look at it. So, I called her back and we had a very nice conversation. She said if anymore came down in her area, she’s going to notify us. So, this is really the first time we’ve had any governmental interest local or otherwise that would report formations to us. So, I think maybe we are turning a little bit of a corner in terms of some recognition that there is something more going on than just that these are all hoaxes, because clearly they are not. This mayor is open minded enough and interested enough in finding out what is going on that she would give us a call to come down and do our research. WHAT ABOUT THE AREA OF UNUSUAL SOUNDS OR LIGHTS? HAS ANYONE REPORTED ANYTHING WITH THIS PAINT CREEK FORMATION? We did manage to get 2 reports of unusual sounds associated with this formation about the time of the formation. The landowner who is the pilot reported to us that he heard a mechanical sound very similar to a 4-stroke engine humming or running in the area of where the island is while he was sitting in his hot tub at his house about a quarter-mile away. It lasted for about two hours that night. He noticed it enough that he was concerned he might have to go back there and find out what was going on, but he didn’t see any lights and didn’t go to check it out. The motor sound that he is describing, he said that what was unusual about it was no revving of the engine. The cadence was exactly the same the entire time, the sound did not go up or down or change in any way. It was like a monotone mechanical sound constant for about 2 hours. We also got the same description by another woman who lives to the west of the island by about a mile or mile and a half and about at the same time. HAVE YOU EVER HEARD OF A STEADY DRONING MOTOR ASSOCIATED WITH CROP FORMATIONS BEFORE? Not exactly. 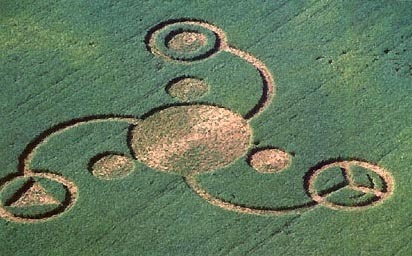 There have been a handful of anecdotal reports of sounds being associated with crop circle formations. There was one that happened earlier this year in the state of New York in which the researchers who were there at the scene interviewed the local neighbors to where a randomly downed formation came down. They described being awakened in the middle of the night by a 3-toned harmonic sound that was loud enough to wake up just about everyone in the neighborhood around that area. Then, the next morning they found the randomly downed formation in the field. 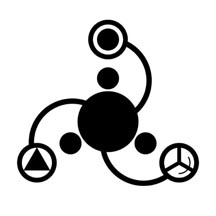 Triskelion, the Greek symbol of the sun in motion. The Triskelion (Greek for three legs) is a symbol of the sun intended to express motion. The design is common in old Celtic artwork and is often referred to as a Celtic Triskele (TRY-skeel). The Triskele has a varied history culturally, being used as a symbol in Celtic, Asian, Italian and Greek cultures. The Triskele is a common symbol used in ancient Celtic design throughout Northern Europe and is especially associated with the Isle of Man where the ancient College of Druids was centered. 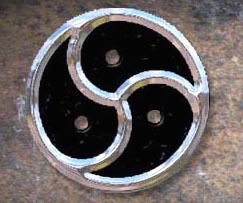 Triskele is also one of Sicily’s symbols that first appeared on the coins of ancient Syracuse. Also called the Triskelion, it is an ancient sun symbol. There is one major difference between the Sicilian and Celtic triskele. The Sicilian legs are bare and the Celtic legs are armored. The emphasis is on the numeral three which for the Celts symbolized the principles of creation, preservation and destruction, embodied also as the triple goddess: virgin, mother and crone. The symbol also represented moon phases. The triskele symbolized Earth, Fire, and Water to Irish pagans. When the Catholic missionaries came to Ireland they used symbols familiar to the pagans to persuade them to convert. The Catholics taught that the triskele symbolized the Holy Trinity: the Holy Spirit, Jesus, and God. Next PostNext Part 2 – Military Interest in Serpent Mound and Seip Mound Formations?